Girly and sweet, our Mermaid Party Pack is perfect for any fashionable young lady! 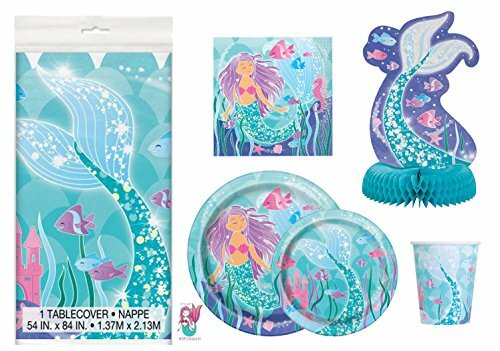 This colorful package gives you enough plates, cups, and napkins for sixteen guests, all featuring our aqua/purple mermaid design. Also includes plastic table cover (60"x84") and centerpiece decoration. Great for birthday parties and sleepovers. If you have any questions about this product by Mermaid, contact us by completing and submitting the form below. If you are looking for a specif part number, please include it with your message.